Excited to attend once again the Misa De Gallo after two years. It’s just my way of feeling the spirit of Christmas whilst away from home. First day – Woah! We have a big church but the people of God is bigger than this. The mass went thru with most of us standing for about 02 ½ hours. The wind blows as freezing as ice. Winter it is! Second Day – Friday weekend means make-up free day. When going to church, I prefer to be the simplest possible. I know God will understand and besides there’s no one whom I should look pretty of. Third Day – Extra off weekend means make-up free day part two. Still feeling cold but not as cold as the first two days. Maybe we are getting used to it. Fourth Day – Sleeping after work is the best remedy to fight sleepiness in mass. That way I can focus and apprehend more the Gospel of God. My body is already getting used in standing for more than 02 hours every day. Fifth Day – Feeling lucky tonight. I was ready to stand again but a good couple beside me managed to give me a little space of their seat. While being thankful, my eyes was stunned by this good looking tall guy in front of me. It was a crush at first sight. He looked so genuine listening to homily, he kneeled on the ground even he’s not on pew, he sang praise of worship while most of the guys were singing in silence, and he had this aura of kindness which was reflecting from his face. From that night, I cannot ever forget this man. Sixth Day – Used to look plain as possible the past few days, but starting last night, my mood changed. I need to look good this time, I need to see him again and I need him to see me. Luck never fails me as if we’re really bound to meet. Not so close but not so far, he’s standing behind my back. Needed to make all the excuses to look behind and secretly glanced at him. Seventh Day – Loosing hope of not seeing him tonight. I looked where he used to stay, my crush was not there. Tried to look on the other side, but my crush was not there. Looking again behind me, but he wasn’t still there. Not until the communion started when suddenly he came from nowhere and boom! I saw him lining up in front. He was staying near the door covered by of people. My night was complete even at the shortest glanced of him. It’s been announced that an exchanged gift will be done tomorrow. Gift giving either with your friends, families or random people. Yes! It’s my chance to meet him closely. And yes, I’m so determined to give him something. Along with my gift, maybe I can give him my mobile number, my facebook account, my email add, my work place, my home address or maybe a crush letter? Haha. I think I’m going crazy. Eight Day – Went to a shopping mall thinking what to buy for him. I wanted something not too personal but not too simple. Definitely not a chocolate or any food for it will not last, definitely not a tee for we’re not still close and definitely not something you used to give to your guy friends. And guess what? I found something unique – a cute screw driver. Haha. Yeah, a mini screw driver with four different tips. After such a long time, it been so refreshing having the feeling of happiness and kilig all over again. Ninth Day – Looking forward for this night. At last! We completed the 09 nights Misa de Gallo. It’s an accomplishment especially for us, Catholics. Another reason, I was about to see my crush knowing that it might be the last time having a glimpse of him. I prepared my best. I even put make up and dolled up myself. I should leave him a good impression even if I don’t know if he knew my existence. 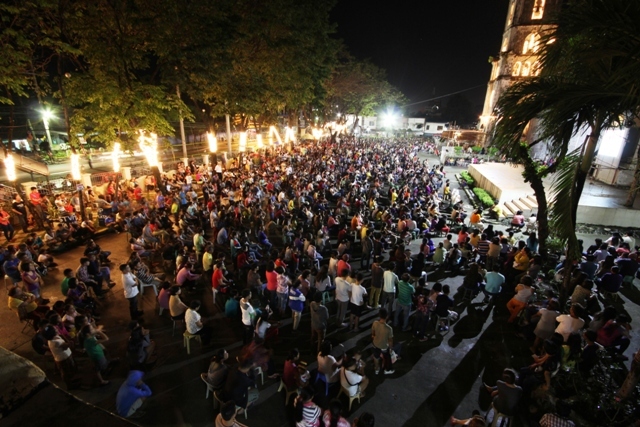 Since it’s the last night, vast of people came – almost doubled than the first few nights. I can’t barely enter the church, can’t hardly move forward and see the altar. But my motivation to complete the 9 nights meaningfully and my desire to see him kept on pushing me to pass through the crowd until I came in the middle aisle where I used to see him. Looking all over the church, he was not there. Definitely I know he was somewhere inside for I know he already completed the 8 nights and he will surely complete the 9th night. Unfortunately, I can’t see him anywhere so I just focused listening to homily. The communion came and as expected I saw him lining in front once again. I checked where he was staying. Lucky him, in this huge number of people, he managed to secure a seat. After communion, I again went in the aisle with him nearby. But what is this? I saw a woman in maybe mid 30’s beside him. She’s even fixing my crush’ t-shirt sleeve. Are they relatives? Are they cousins? Are they friends? No, no, no. I don’t think she is his girlfriend. My crush is way more handsome for this woman. But as time passes, the more I sensed that they have something else. I tried my best to look as natural as possible. As if I didn’t see anything. After mass, I can’t hardly find my way out since people were stuck in the aisle. I took the chance to get closer to him. I moved in his side knowing that he was right behind me, maybe an inch apart due to jammed crowd. I saw that woman move ahead of him and they are both searching for one another. Until I saw the woman wearing ring in her ring finger. Is that a wedding ring? No, no, no. It’s not real. Unfortunately, my crush had manage to pass through me and I also noticed he has a ring in his ring finger. Then reality hits me! They are married! My fantasy suddenly crushed into pieces. I don’t wanna believe it, but it’s true. I don’t wanna face it, but they are right in front of me clinging with one another. Then I came to a realization that maybe this is God’s plan – we are not meant to be. Anyways, God really hears your prayer. He heard that I wished I can see him with someone else and yes, there they are. As I looked at him with his wife, I can see that they are happy together. And since its Christmas, I just let go of my craziness and wished them a happy married life. I wrote this mini diary just as my thought extension. In this way I am helping myself getting rid of craziness I have for my crush. Please bear with me. And please don’t judge my way of attending the Misa de Gallo. It only seems that my crush is just my motivation to finish it. But in all honesty, I started this mass with the pure intention of finishing it no matter what. I learned a lot about God in the past 9 nights that is worth living up my life with. I think it’s just a bonus that I met this man. A gift from God maybe – to be happy even for a while and even for a distance. Thank you.